NOTU chairman Usher Wilson Owere (3rd left) with other union executive committee members adress journalists at the union offices in Ntinda, Kampala. Trade unions in Uganda have disputed the government proposed salary enhancement for civil servants with their own, warning that should the State not comply with their proposal by June 23, they will withdraw their services. Under their two umbrella bodies, the National Organisation of Trade Unions (NOTU) and the Central Organisation of Free Trade Unions (COFTU), their counter proposal on salary enhancement indicates that the least paid public servant should earn a monthly salary of Shs700,000 contrary to government’s proposal of a paltry Shs275,000. They also want the highest paid civil servant to earn monthly salary of Shs12m contrary to the government’s proposal of Shs4m. They said the lowest ranking government employee, who is a cleaner/janitor, should earn a salary of Shs1.3 million by 2022 while the highest paid should earn Shs23 million. 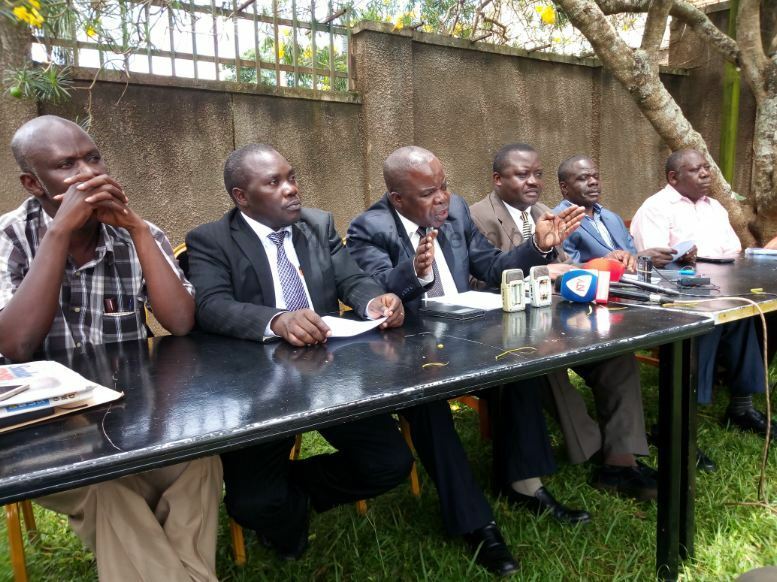 During a press conference held at NOTU head office in Ntinda, a Kampala suburb, the trade union leaders condemned government for maintaining its position of selective pay rise for public servants in disregard of the ongoing negotiations with the trade unions. The secretary general NOTU, Mr Peter Werikhe, said it was unlawful and unfair for government to reaffirm their commitment yet the negotiations were still ongoing. Mr. Werikhe said talks between trade unions and government broke down as the government negotiating team alleged that the trade unions had no mandate to make a binding decision on salary enhancement for public service workers. He warned that the industrial action planned for 23rd June still stands unless a remedy is provided before that date and urged all workers across the country to join the struggle. The NOTU chairman general, Mr. Usher Wilson Owere, said the salary enhancement that was released by government is discriminative and exploiting the workers. He further asserted that they were compelled to come up with a collective and harmonized counter proposal on salary enhancement in accordance to the Labour Unions Act 2006 and the public service negotiating, consultative dispute settlement machinery Act of 2008 that allows Labour unions to negotiate salaries on behalf of the workers. Mr. Owere lashed at State minister for Finance David Bahati, accusing him of misguiding the government on issues of salary enhancement. The COFTU secretary general and Workers MP, Dr Sam Lyomoki, said as union leaders, they are committed to safe guard and promote social economic rights of the workers. He said the decision to come up with a collective and harmonized counter proposal on salary enhancement was reached after carrying out thorough research and consultations with various stakeholders.